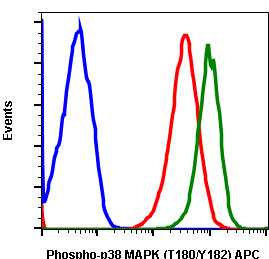 P38 mitogen-activated protein kinase (MAPK) is a stress-activated serine/threonine protein kinase and belongs to the MAP kinase superfamily. Various stress stimuli such as ultraviolet light, irradiation, heat shock, proinflammatory cytokines, mitogens, and high osmotic stress can activate p38 MAPK through phosphorylation of a TGY motif within the kinase activation loop (1). This event plays an improtant role in cell differentiation, apoptosis and autophagy. 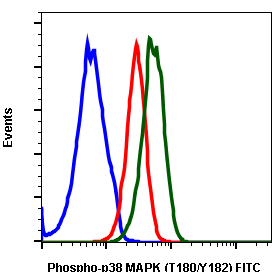 MKK3 and SEK activate p38 MAPK by phosphorylation at Thr-180 and Tyr-182. 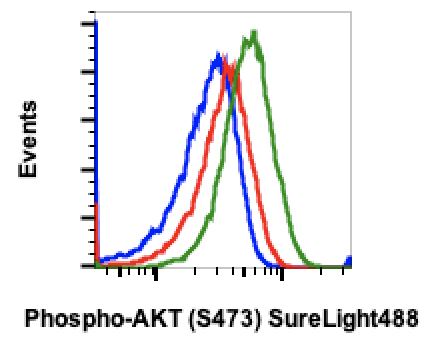 Activated p38 MAPK has been shown to phosphorylate and activate MAPKAP kinase 2 and to phosphorylate the transcription factors ATF2, Mac and MEF2. 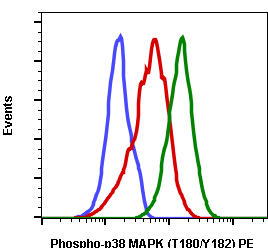 p38 MAPK also has been shown to phosphorylate post-transcriptional regulating factors like TTP (2). 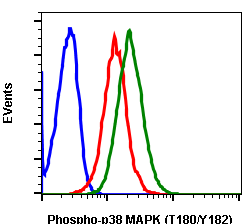 A synthetic phospho-peptide corresponding to residues surrounding Thr180/Tyr182 of human phospho p38 MAPK. (1) Corre I, Paris F, Huot J. (2017) Oncotarget. 8:55684-55714. 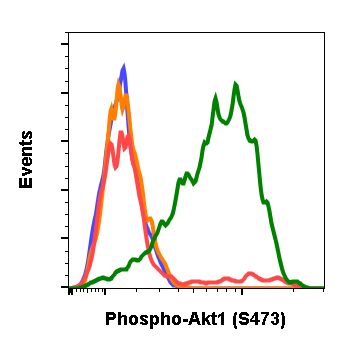 (2) Tudor C, Marchese FP, Hitti E, et al. (2009) FEBS Letters. 583: 1933–1938. 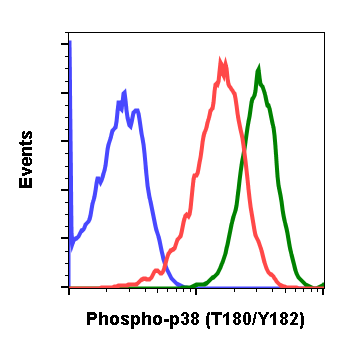 Flow cytometric analysis of C6 cells secondary antibody only negative control (blue) or untreated (red) or treated with staurosporine (green) using phospho-p38 MAPK (Thr180/Tyr182) APC-conjugated antibody P38MAPKT180Y182-E3 APC-conjugated. Cat. #1159.